Under the Council-Selected Restoration Component, commonly referred to as "Bucket 2", the RESTORE Council as awarded grants and interagency agreements in each of the Gulf Coast states of Alabama, Florida, Louisiana, Mississippi and Texas, as well as Gulf-wide projects and programs, which are those projects or programs in two are more of these states. On January 24, 2018, the RESTORE Council voted to approve the 2017 Funded Priorities List: Comprehensive Plan Commitment and Planning Support (2017 CPS FPL) in accordance with the RESTORE Act. This award provides funding to Council members to enhance collaboration, coordination, public engagement and use of best available science needed to make efficient use of Gulf restoration funds resulting from the Deepwater Horizon oil spill. These funding awards will support the Council’s commitment to a coordinated approach to ecosystem restoration, as called for in the Comprehensive Plan Update 2016: Restoring the Gulf Coast’s Ecosystem and Economy. 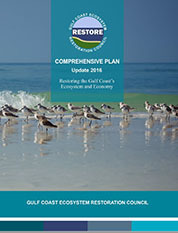 The RESTORE Council is using funds from the settlement with Transocean Deepwater Inc. to not only provide near-term, on-the-ground ecosystem benefits, but also to conduct planning activities designed to build a foundation for future success in the Gulf Coast states of Alabama, Florida, Louisiana, Mississippi and Texas.